Balloons released by schoolchildren sparked a major security alert in South Korea, reports say, amid heightened tensions with North Korea. A resident of Ansan, near Seoul, reported seeing 40-50 objects resembling parachutes falling on a mountainside. The military and police mobilised a special joint task force. 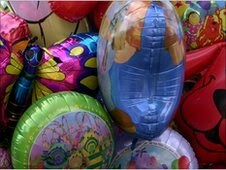 Upon investigation, the objects turned out to be helium balloons released by a local school. Tensions between North and South Korea have been running high since the sinking of a South Korean warship earlier this year. Seoul said the ship was torpedoed by Northern forces. In another incident earlier this month, an alert was raised after an explosion was heard on Yeonpyeong island, near the sea border with North Korea, and a diving suit was found on a shoreline, the JoongAng newspaper reported.